We strive to provide the best quality music lessons for our students. Our goal is to give them the required skills, appreciation and enthusiasm to pursue and accomplish any musical goal they should have. We teach weekly private lessons at Let's Play Falls Church. The student retains the same lesson time and day every week. We offer thirty minute, sixty minute and ninety minute private lessons on voice and the instruments listed below, (schedules permitting). Guitar lessons are offered Monday through Saturday. We have several instructors that teach guitar. Each instructor has a different area of expertise, but all are able to offer generalized instruction (beginning to intermediate). All of them have professional stage/recording experience. Please see our teacher bios to see which instructor might have a specialized skill that you find interesting . Lessons are devoted to technique, theory, transcription, *reading and of course, playing. 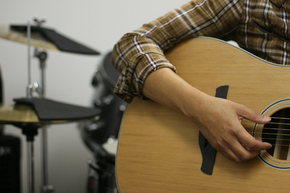 *Our guitar instructors encourage reading standard musical notation for younger students, but we understand that this is not a priority for all students. Piano lessons are offered Mondays through Thursdays. We have several different piano instructors at Let's Play. Our emphasis is on classical technique and repertoire, although other styles (rock, pop, standards, show tunes, etc.) are offered. Piano students are encouraged to participate in several recitals held each year and to enter an annual festival performance (for more information, please contact us). Drum/Percussion lessons are offered Mondays through Wednesdays. Our drum lessons are all encompassing - with emphasis on the basic fundamentals of rudiments. We teach technique on: snare, tuned percussion (mallets), drum set in multiple settings -band, orchestra, rock, jazz, etc. Voice lessons are offered Mondays through Thursdays. Electric bass lessons are offered Mondays through Saturdays. Our instructors teach a variety of styles and techniques including rock, jazz and blues, funk and r & b, country, etc. "My two children and I have taken lessons from Let's Play Music since it opened. I take guitar, my first son takes piano, and my second son takes voice, piano, and bass weekly and studies percussion in the summer. I have always been pleased with the level of professionalism and musicianship of the teachers. " "Both my kids have gone there, my son for bass and guitar and my daughter for voice. Great instruction, friendly people all around, a wonderful experience.﻿"
"Both my kids took guitar lessons w/ Mr. Ted. He really knows how to relate with the kids. They love him!!! My oldest is now in a HS rock/alternative band. He plays Awesome!!! Thanks Mr. Ted!!!" "I have been taking guitar lessons for over a year now at Let's Play Music! Because of changes in my schedule I have had three different instructors, all of whom have been great." "My son took an interest in the guitar and I thought I would start him off with some lessons before he learned any bad playing habits. A friend recommended Tedd w/Let's Play. My son really enjoys his weekly lesson and Tedd teaches with a relaxed & fun manner. Glad we found him! I would highly recommend Tedd w/Let's Play!﻿"
Copyright 2012 Let's Play Music!. All rights reserved.